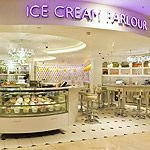 At the Ice Cream Parlour you can enjoy one of the many imaginative flavoured ice creams and freshly prepared juices. Flavours range from classic chocolate to pistachio and raspberry. Do you work at Ice Cream Parlour? What did you think of Ice Cream Parlour?